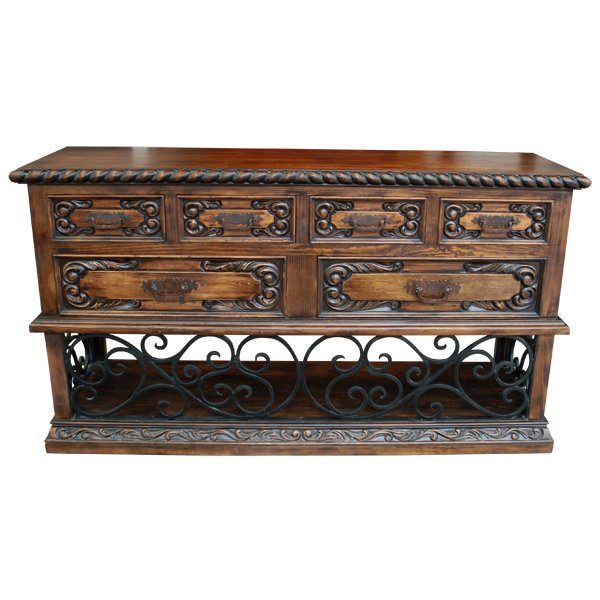 This handcrafted, Spanish colonial style credenza incorporates lovely, hand forged iron designs with marvelous, hand carved details. 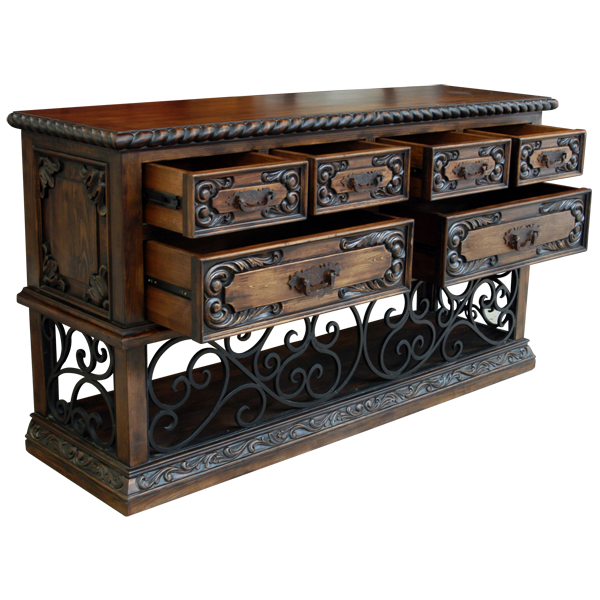 The credenza features six rectangular drawers, and the sides of each drawer are embellished with magnificent, hand carved, floral and scroll designs. Centered in each drawer is a hand forged, iron handle. The top four drawers are the smallest, and directly below the small drawers are two, large, spacious, rectangular drawers. The credenza has a lovely, light, antique finish, with a large, open top and a classic, straight top rim. The top rim has a twist rope design, and the molding design of the top rim is repeated in the base. Each lateral side of the credenza is enhanced with a decorative, rectangular cut panel, and the credenza is supported by straight, wood legs. 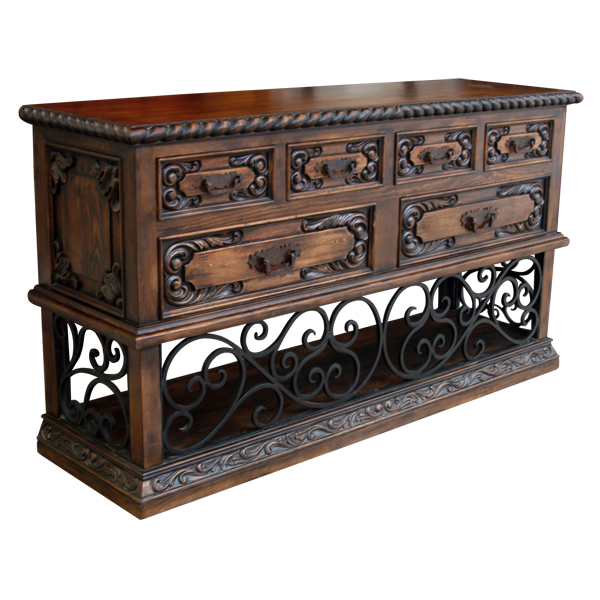 The credenza rest on a solid wood platform, and the sides of the platform are decorated with ornate, hand carved, floral and scroll designs. The front and side open spaces between the base and the platform are adorned with curved, hand forged iron, interconnecting details. The credenza is made with the best, sustainable, solid wood available. 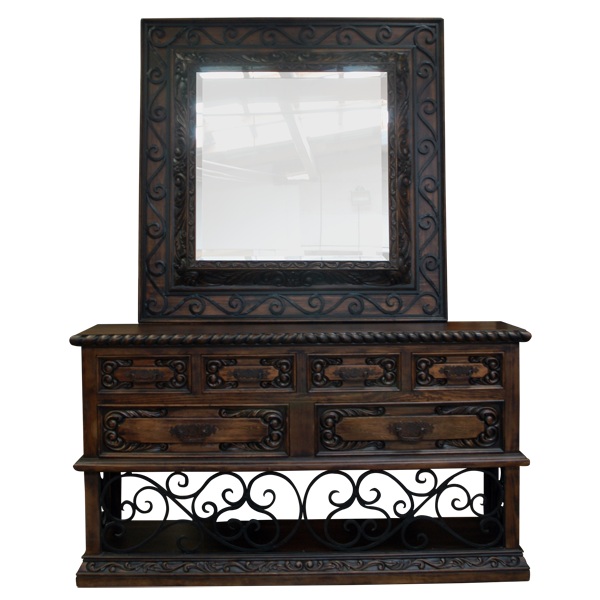 A mirror can accompany the credenza, and the frame of the mirror is made with solid wood. Embellishing the frame are hand forged iron designs with curved details. The credenza can be purchased with or without the mirror. The credenza and mirror are 100% customizable.